When I talk to people about health care social media, I always mention how it lets information be shared quickly and easily, and network with people from a range of professions/walks-of-life from all around the world. However, the thing I value the most and try to emphasise the most, is the participative, interactive nature of social media. Social media is where the debates are held; those of us who want to influence and participate in decisions gather and test our ideas on social media. Twitter is especially good for this: it lets anyone join in and contribute to- and be enlightened by- the contest of ideas. In health and education roles I encounter many people who give dumb blanket statements like, “I will never use Twitter – I don’t care what Justin Bieber had for breakfast”. Much to my embarrassment, this is the sort of thing I hear nurses (especially those in positions of influence and power) say all the time. These people are so stubborn that they won’t even look, listen or learn about professional use of social media. A few months ago two Australian nurse lecturers forthrightly and very confidently told me that Twitter and facts are (somehow) mutually exclusive, and they do not and never will use it. I tried being zen about the whole thing (water flows around resistance, rocks in the stream shift or erode), and celebrated some of the nurse academics who are more enlightned about health care social media (see storify.com/meta4RN/lecturers). However, the same thing keeps happening: people in positions of power and influence in the health care and higher education systems are still using silly, uninformed, blanket statements to decry the use of social media and warn people off from using it. No more Mr Nice Guy – I’m calling these people what they are: Luddites. People being resistive to new technologies and innovations is not new, and in my lifetime I have seen that change is inevitable – the luddites and laggards will catch-up eventually. In the 1970s I knew people who refused to play video-games like Space Invaders – “No it’s too confusing, I’m sticking with the pinball machine” said my friend when we went into the pinball parlour. In the 1980s I knew people who refused to use ATMs (automatic teller machines) – “No, you can’t trust a little card and machine. I’ll wait until the bank opens on Monday.” said my relative. In the 1990s I knew people who refused to use computers. Every now and then I still hear people say, “I don’t believe in computers” as if computers are akin to the tooth fairy or religion. In the 2000s I knew people who refused to use a mobile phone, “Why would I ever need one?”, people would say. Now, in Australia, there are more mobile phones than people (for more info: meta4RN.com/mobile). In the 2010s I know people who refuse to use social media. As evidenced by the “I don’t need to know what Justin Bieber had for breakfast” type of statements, the reason they don’t use it is twofold:  they do not understand it, and  they decline the opportunities to learn. I guess I should be patient with my resistive colleagues – history shows that they’ll come around eventually. However, for those nurses and midwives in positions of power and influence, I’m hoping people will print and fax you a copy of this picture below. If you can’t summon the willingness to learn about professional health care social media, please summon the dignity and sense to stop critiquing something you do not understand. 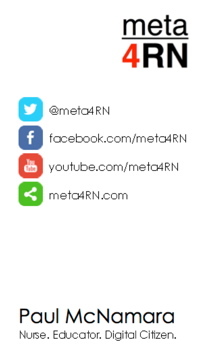 This entry was posted in Blog and tagged #HCSMANZ, #SoMe (Social Media), AHPRA, blogging, Facebook, Google+, innovation, nursing, Twitter on 3 May 2014 by Paul McNamara. Once upon a time I worked in a pilot program as a School-Based Youth Health Nurse. This role put me in close contact with teachers. By listening to their conversations about managing classroom behaviour I was introduced to a strategy that teachers use: “Catch them being good“. In short, the teachers said it was very easy to get caught-up in noticing and reprimanding students about unwanted behaviours – so easy that it could completely monopolise lesson time some days. A smarter strategy was to hone-in on, recognise and celebrate students who were behaving well. Don’t try to catch students being naughty – try to catch them being good. Over the last two weeks Australian Health Professionals have caught AHPRA, the agency that regulates us all, being good. 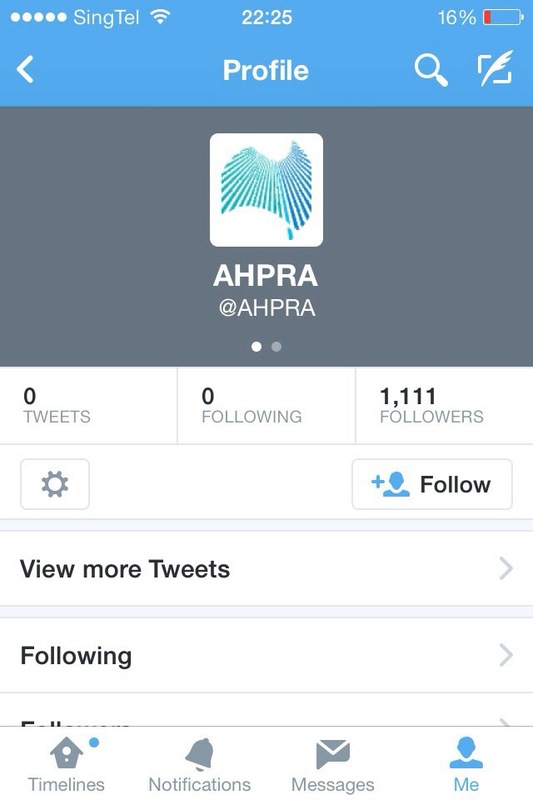 On Monday 19th March 2014 AHPRA joined the conversation on Twitter. After years of watching the AHPRA Twitter handle sit as stony-faced and as silent as an Easter Island statue, it suddenly sprang to life. A few days later AHPRA announced that there would be changes to the advertising guidelines to be clearer about the use of testimonials, This change was in response to many concerns being raised by health practitioners that the initial set of guidelines had unrealistic, unworkable expectations regarding the use of social media. 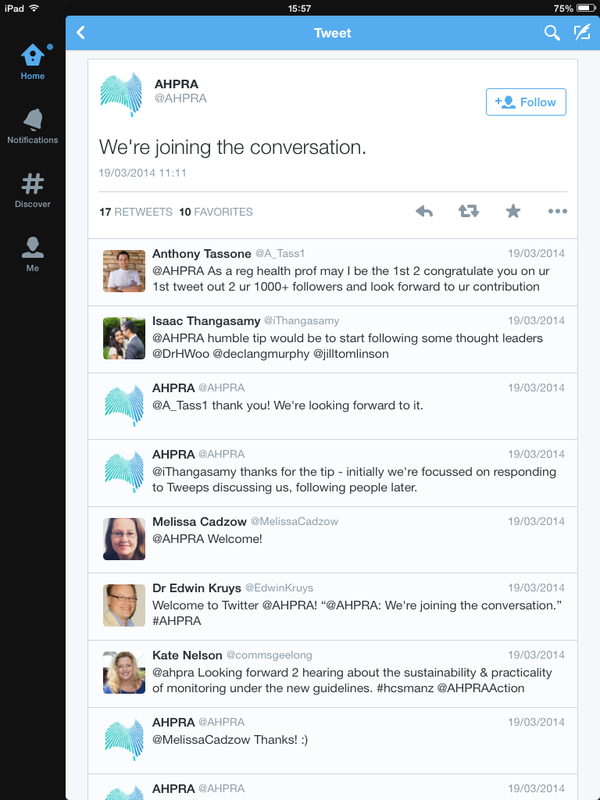 Then, on Friday 28th March 2014, there was a Twitter chat with AHPRA CEO Martin Fletcher using the hashtag #AHPRAqanda. Health professionals were able to seek clarity around expectations of the advertising and social media guidelines, and engage directly with AHPRA and each other about specific concerns. 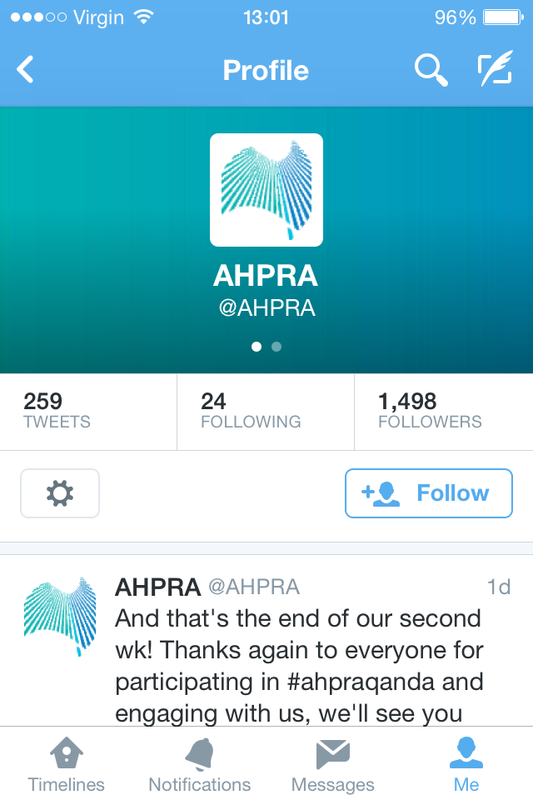 AHPRA are only two weeks into their engagement on Twitter and have been pretty clear that they intend to walk before they try to run. I am very pleased that AHPRA are on Twitter because it will help me address some of the fear (bordering on paranoia) that is expressed every time I facilitate an inservice on professional use of social media. Health professionals often express that they are reluctant to use social media in a professional sense because they fear that either their employer or AHPRA will see it as a bad thing. Now I will be able to confidently counter that concern by reinforcing my previous argument that health professionals should be unafraid to speak up and join in the conversation on social media. 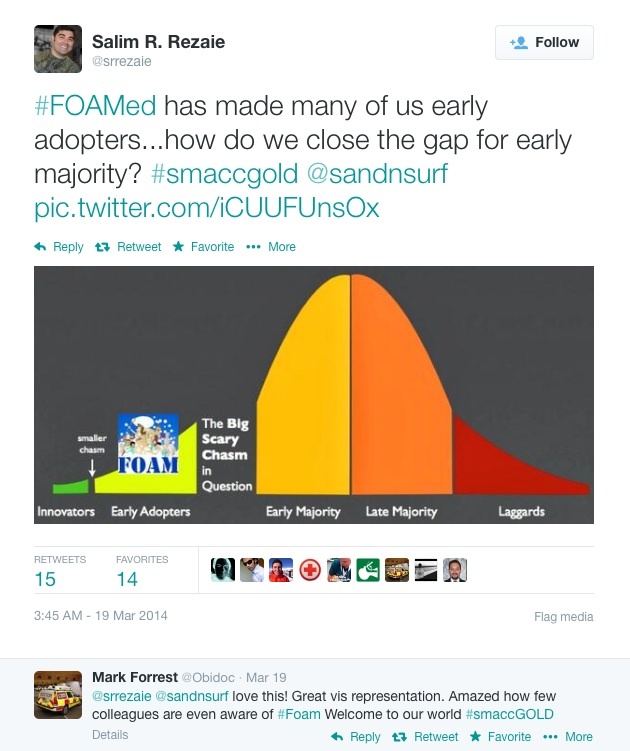 Now that AHPRA has joined the conversation, maybe there is something of a bridge across “the big scary chasm” between the early adopters and the majority of Australian healthcare professionals using social media. This entry was posted in Blog and tagged #HCSMANZ, #SoMe (Social Media), AHPRA, Twitter on 30 March 2014 by Paul McNamara. First-up, just in case you’re late to how this story started, let me give a bit of background/context as I understand it. The Australian Health Practitioner Regulation Agency (AHPRA) lost control of distribution of their preliminary consultation paper on social media policy. The document started turning-up online – think WikiLeaks-Lite – and was soon being shared amongst health professionals and others via (you guessed it) social media (BTW: social media is often abbreviated as “SoMe”, which I hope is an ironic hat-tip to the assertion that using social media is a narcissistic undertaking – “it’s so about me“). I have found this conversation on twitter informative, thought-provoking, occasionally irreverent, often entertaining, and something that enhances (not risks) my understanding of what it is to be a health professional. As you will see, health professionals are engaging with social media in a manner that does not conform with the draft guidelines. Health professionals are critiquing matters they find important, some are advertising their services, they don’t always hide their comments from the public (ie: their patients could read them), and are doing so in manner that is probably very similar to how they would interact in a tea room, at the nurses station or while attending a conference. That is the point I would like to make most strongly: social media is not different to real life, it is real life. Social media does not stand apart from real life anymore than the telephone, email or letter-writing does. Health professionals are trusted to go “behind the curtain” (both literally and metaphorically) when with people (aka patients) often at their most vulnerable time in life. Surely then, health professionals should expect to be trusted in the very public arena of social media. I submit the suggestion that AHPRA should revisit the draft policy from a completely different standpoint. Acknowledge an assumption of professionalism whenever a health professional is representing themselves as such, and encourage health professionals to embrace the potential of emerging technologies, not fear them. If AHPRA cannot support this movement [health professionals using social media] positively and enthusiastically, then it should at least have the grace and wisdom to step out of the way and do not obstruct it. Ironically, AHPRA have motivated me to get more involved in SoMe than I would have otherwise. 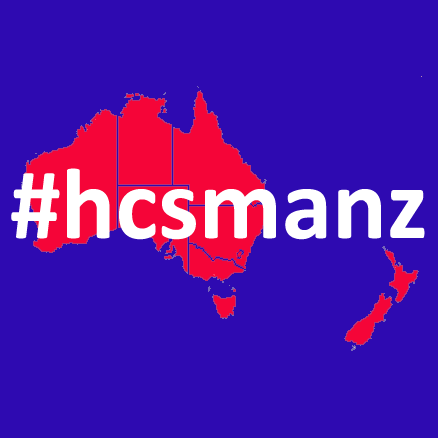 I found many like-minded people via this Twitter hashtag: #HCSMANZ and have been inspired to do more, not less, with SoMe. I hope AHPRA finds this creative, energetic, kind-of-geeky group worthwhile consulting with in future. APHRA have sent an email acknowledging receipt of submission to the preliminary consultation paper on social media policy, and advise there will be a round of public consultation. You Me We haven’t heard the last on this subject. This entry was posted in Blog and tagged #HCSMANZ, #SoMe (Social Media), AHPRA, Storify, Twitter on 25 September 2012 by Paul McNamara.